Senior athletes and parents were recognized at Monday’s home quad meet! Author Coach PlunkettPosted on April 28, 2015 April 28, 2015 Categories Track & FieldLeave a comment on Congrats Seniors! Today’s quad meet vs. Willowbrook, Addison Trail, and Proviso East will also serve as the DGS Senior Night celebration. All senior athletes and their parents should meet at the north end of the bleachers at 4:30pm prior to the start of the meet to be recognized. This is the last home meet of the season for the girls team. The varsity team competes on Friday at Wheaton South. Author Coach PlunkettPosted on April 27, 2015 April 27, 2015 Categories Track & FieldLeave a comment on Senior Night Meet! DGS competed in the 15-team Lockport Inivational for the first time on Saturday and came home victorious. The Mustangs scored 72 pts to win over 2nd place Homewood-Flossmoor (64.5 pts). Host Lockport scored 59 pts for 3rd place. DGS placed 1st in two events on the cold, windy, and rainy night. Katie Stapleton led the 3200m run from start to finish winning in 11:37.02. And the 4x400m relay team of Rachel Petro, Lauren Wong, Mary Beine, and Michaela Hackbarth dominated the field with a time of 4:06.31. Other point scorers were: Rachel Petro (3rd in 400m), Shaliyah Dixon-Tucker (5th in 200m), Michaela Hackbarth (2nd in 800m), Abby Kargol (3rd in 1600m), Amanda Thate (4th in 1600m), Soren Umali (5th in 100H & 4th in 300H), Lauren Wong (6th in 300H), Lauren Ackermann (6th in pole vault), Maddie Manganiello (4th in long jump), and Kiera James (5th in triple jump). DGS also scored points placing 3rd in the 4x100m relay (Muccianti, Finley, Petro, Dixon-Tucker) and 3rd in the 4x800m relay (Beine, Seitz, Alcantara, Boyle). Author Coach PlunkettPosted on April 26, 2015 April 27, 2015 Categories Track & FieldLeave a comment on Mustangs win Lockport Invite! Varsity to compete at Lockport tonight! The girls varsity track team travels to Lockport today to compete in the Christine Marszalek Invitational. This will be the first time the that the Mustangs have attended this meet (it replaces the Lake Park Invite from last year). There will be 14 teams competing in the high-powered varsity only meet, including cross-town rival DGN. Team buses will leave DGS at 3:30pm and everyone on the team is welcome to ride the bus to the meet. Field events will begin at 5:00pm and running event finals will begin at 6:00pm. Author Coach PlunkettPosted on April 24, 2015 April 26, 2015 Categories Track & FieldLeave a comment on Varsity to compete at Lockport tonight! The DGS varsity team placed 3rd out of 9 teams at Saturday’s Wheaton North Invitational. The Mustangs were led by 1st place finishes in the triple jump (Kiera James), 100m hurdles (Shaliyah Dixon-Tucker), and the 4x100m relay (Nicole Muccianti, Ariana Finley, James, and Dixon-Tucker). The DGS JV team placed 6th out of 10 teams. First places finishes were by Sonja Renowden in both the 200m and 400m dashes, as well as the 4x100m relay and 4x200m relay teams (combination of Renowden, Lauren Ackermann, Alexus Allen, Abby Davenport, and Izzy Taylor). All levels compete on Wednesday in a triangular at Lyons Township with York. DGS travels to the 10-team Wheaton North Falcon Blue & Gold Invitational this afternoon. The bus will leave DGS at 3:30pm. Field events will start at 4:30pm and running events will start at 5:00pm. Teams competing include Buffalo Grove, DGS, Glenbard East, Maine South, Neuqua Valley, Oswego, Sandburg, Wheaton Academy, Wheaton North, and Wheaton South. Author Coach PlunkettPosted on April 17, 2015 Categories Track & FieldLeave a comment on Wheaton North Invite today! DGS duo runs Arcadia Invitational! On Saturday, April 11th, both Michaela Hackbarth (So) and Abby Kargol (Sr) raced against many of the nations best high school distance runners at the Arcadia Invitational. Michaela took the track in the heat of the early afternoon California sun to compete in the 800m run. She finished 6th in her heat, with a great time of 2:14.01 which currently sits as the #1 time in Illinois and the #40 time in the United States. Seven hours later, under the lights, Abby had her turn on the track to race the 3200m run. Abby ran a fantastic race, bettering her own school record by 5 seconds with a finishing time of 10:45.53. Her time is currently the #2 time in Illinois and #50 in the United States. Both girls join back with the rest of their teammates at this Friday’s Wheaton North Invitational. Author Coach PlunkettPosted on April 15, 2015 April 22, 2015 Categories Track & FieldLeave a comment on DGS duo runs Arcadia Invitational! Frosh/Soph places 3rd at DGS Invite! The Frosh/Team placed 3rd out of 8 teams at Saturday’s DGS Invitational. The Mustangs scored 99 points to finish behind Lyons Township (125 pts) and Glenbard West (112.5 pts) and well ahead of 4th place Hinsdale Central (56.5 pts). Lauren Ackermann (So) placed 1st in the pole vault with a jump of 7-6. Izzy Taylor (Fr) placed 4th with a vault of 7-0. Sonja Renowden scored a 2nd place in the long jump with 14-8. Alessandra Lane (So) grabbed 4th place in the triple jump (30-9) to round out the field event scoring. Fourth place finishes were popular among the Mustang distance runners as Kara Petersen (So) took 4th place in the 800m (2:30.30), and Alyssa Taglia (Fr) took 4th place in both the 1600m (5:50.89) and the 3200m (12:42.89) races. Natalie Olsen (Fr) added a 6th place finish in the 3200m (13:02.62). Izzy Taylor came back to place 3rd in the 100m dash (13.99) while Alexus Allen (Fr) took 3rd in the 200m dash (28.95). Sarah Ansah (Fr) finished 3rd in the 300m hurdles (54.66) while Shalyn Martinek (So) ran to 4th place in both the 300m hurdles (55.03) and the 100m hurdles (19.64). The F/S team also had a lot of success in the relays, placing 1st in the 4x100m relay (Renowden, Abigail Davenport-Fr, Allen, and Ackermann) in 52.75 and the 4x200m relay (Ackermann, Allen, Davenport, Asia Branch-Fr) in 1:53.31. The 4x400m relay team of Ansah, Renowden, Johanna Skibbe-9, and Petersen finished off the day with a 4th place effort of 4:33.60. Author Coach PlunkettPosted on April 15, 2015 April 15, 2015 Categories Track & FieldLeave a comment on Frosh/Soph places 3rd at DGS Invite! DGS varsity takes 1st at Mustang Invite! 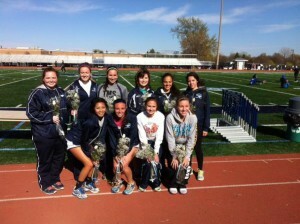 On Saturday, April 11th, the DGS girls varsity track team took 1st place honors at our own 8-team invitational. The Mustangs scored 124.5 pts to easily outdistance the 2nd place Lyons Township team (104 pts). It was a full team effort with scoring coming from field events, distance, sprints and hurdles. Field event scoring came mostly from the dynamic duo of Kiera James (So) and Maddie Manganiello (Fr). Both were entered in the long jump and dominated finishing 1st and 2nd out of 15 jumpers in the event. Kiera took first with a jump of 17-3, while Maddie placed 2nd with a leap of 16-2.5. Kiera came back to place 2nd in the triple jump with an outstanding 36-6 leap. Maddie furthered the DGS cause by scoring 6th places finishes in both the high jump (4-10) and the pole vault (8-0). In the four distance events, the Mustangs picked up 3rd, 4th, 5th, and 6th place points. The 4x800m relay team of Amanda Thate (Sr), Jillian Boyle (Jr), Mary Beine (Sr), and Megan Ocampo (Sr) placed 3rd (10:18.37). Katie Stapleton (So) placed 4th in the 3200m run with a time of 11:45.46. Maggie Seitz (Jr) placed 5th in the 800m running 2:29.94. Amanda Thate (Sr) took 6th place with 5:25.07 in the 1600m. The sprinters dominated the competition scoring well in all of the shorter races. Nicole Muccianti (So) and Ariana Finley (Jr) placed 2nd and 5th respectively in the 100m dash with times of 13.17 and 13.38. Shaliyah Dixon-Tucker (Jr) took first in both the 200m dash (26.80) and the 100m hurdles (15.26). Soren Umali (So) doubled the scoring in those events by placing 3rd in the 100m hurdles (16.25) and 6th in the 200m (28.60). Lauren Wong (Jr) took 1st in the 300m hurdles with a great early season time of 48.53. Rachel Petro (Sr) won the 400m dash with another great time of 59.50. The Mustangs also won two out of the three sprint relays and placed 3rd in the other. The 4x100m relay team of Muccianti, James, Finley, and Dixon-Tucker placed 1st with 50.07. The 4x200m relay team of Muccianti, Beine, Umali, and Finely finished 3rd in 1:49.01. And the 4x400m relay team (Wong, Beine, Seitz, and Petro) capped off a great meet with a victory running 4:09.50. Author Coach PlunkettPosted on April 13, 2015 April 14, 2015 Categories Track & FieldLeave a comment on DGS varsity takes 1st at Mustang Invite! DGS girls to compete at Arcadia! Two distance runners will be representing DGS at the prestigious Arcadia Invitational in California on Saturday. Michaela Hackbarth will be running in the 800m race at 3:04pm (CST) and Abby Kargol will be running in the 3200m race at 10:40pm (CST). A live stream of the meet can be found on ArcadiaInvitational.org. Live results during the meet will be posted on live.EPISports.com. Author Coach PlunkettPosted on April 9, 2015 April 14, 2015 Categories Track & FieldLeave a comment on DGS girls to compete at Arcadia!